Discussion in 'Iowa Long Beard Conference' started by DGorman, Oct 22, 2018. I had a chance to hunt a stand last night that the wind is an issue quite often. I did have an encounter with a nice buck but he stayed across the creek about fifty yards into the neighbor's ground. He was interested in my grunts but soon grew tired of me bothering him and went the other way. Dejected, I sat down and began sulking. A couple minutes later I heard a cluck behind me. I glanced over my shoulder and the group of four toms that clutter my tail camera cards was making its way along the logging road. I figured there was no way I'd be able to get ready for a shot but thought it was at least worth a try. I reached over and grabbed my bow from the hanger and fumbled with my d loop. I had previously ranged the trail at 34 yards so I at least had that going for me. As I finally got my release hooked they had stopped and were definitely alert. The lead tom stopped. They stood still and clucked for a few seconds until the second bird decided he wanted to continue. He walked past the first bird and as he went behind the last tree I drew. He continued into the clearing and before I knew what was happening the arrow was on its way. I knew the shot was low and toward his rear end but the thump let me know i had hit more than feathers. He quickly walked about twenty yards then stopped for a few seconds before he turned off the trail into the thick brush. I waited about an hour and decided I'd like to try to find him before dark so i got down a little early and headed to my arrow. It had quite a few feathers stuck to it and the vanes were bloody. I followed the road to where I thought he went into the brush. There was no blood, just a random cut off feather every few feet. As it got darker my hopes of finding him dwindled. Then I found a pool of blood. Then a faint trail and more blood. I called my wife and had her bring me a better light. She also brought our five year old. He was having a great time crawling through the brush looking at the blood trail. It took some time but were we're able to find the bird and get him taken care of. As an added bonus since they had come to help I now had a ride back to the house on the quad. 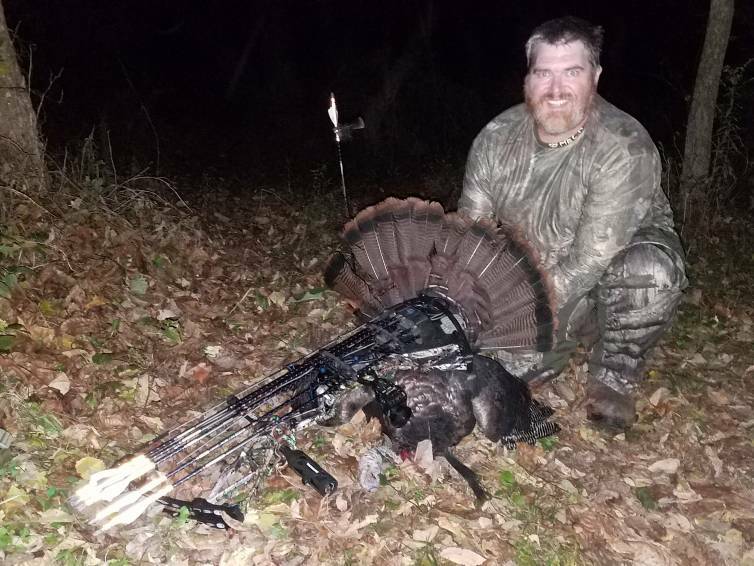 I didn't weigh him but he was a good bird with 11 1/8 beard and 1 1/4 spurs. I always joke about how I buy fall turkey tags as a joke to deter them from hanging around my stands. It's pretty nice to actually fill one occasionally. Oak, Ishi and Daver like this. Congrats on a great bird.